Today you want to guard against letting petty arguments and squabbles erupt into a flurry of negativity. 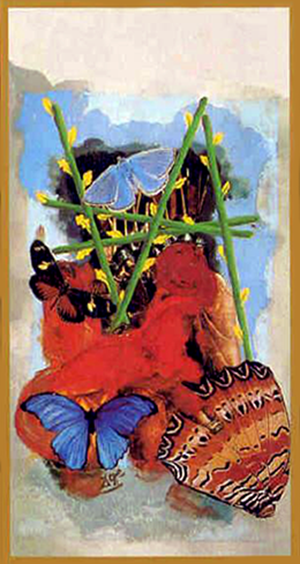 The Five of Wands, seen here in the Dalí Tarot Universal version of the card — is sometimes referred to as the “bully” card. It’s tied to a battle of wills (or words) in which winning is the ultimate goal. It doesn’t matter whether you’re on the giving or receiving end when it comes to this card. The “winner” doesn’t really win anything other than the satisfaction of being right or of taking home some meaningless prize. There’s a noisy, restless blur of activity seen in this version of the card. Even though there are five beautiful butterflies here, it’s hard in some cases to tell where one ends and another begins. Each butterfly is distinctive — just as each point of view is unique to the person expressing it. But it’s precisely that uniqueness that can erupt into conflict, as differences of opinion can fuel animosity. The Five Wands in this card are green and fertile. They do all exhibit symbols of growth. But they’re stacked haphazardly and are all crossing one another — and most importantly they act as barriers between the butterflies and the castle on the other side. Ask yourself today whether expressing certain attitudes or opinions are creating friction between you and important people in your life. And then ask yourself whether being right — or winning — is worth jeopardizing your relationships with others. If you’re engaged in a power struggle, you can bet there will be no winners or loser, only the tattered remains of what once was a unified front. The Five of Wands encourages you to move past the chaos and calamity, and work on restoring the peace. This deck was published by US Games. The Dalí Tarot Universal is out of print and has become very hard to find, but is well worth it if you come across one. Previous Post: Ask the Astrologers: Is He Gone for Good?